Designs for the younger set. 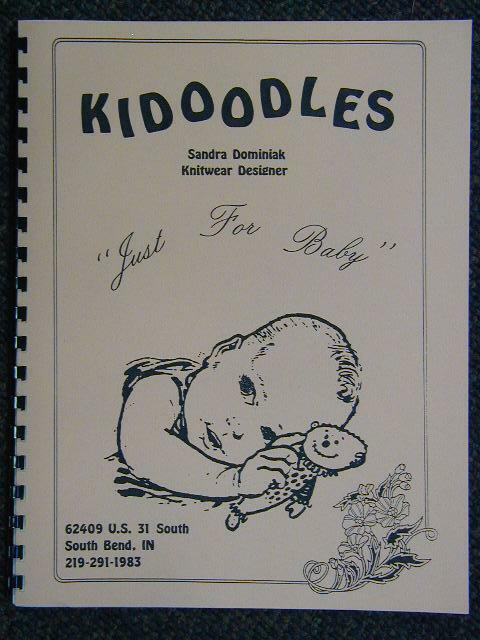 A must for any knitters pattern library. 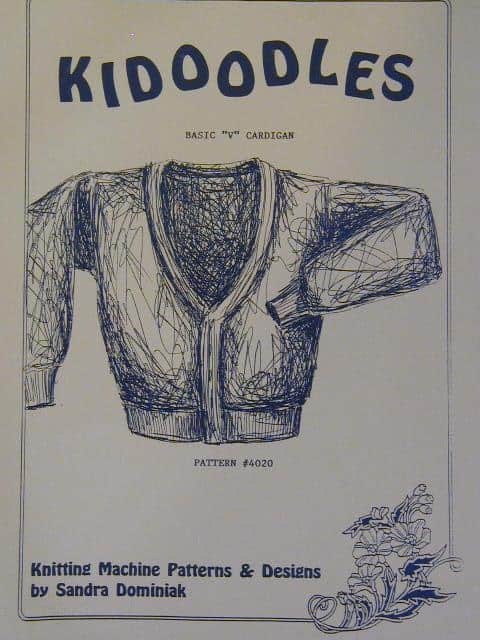 A complete book of basic set-in sleeve sweater styles. Cute matching pants with feet that make for a perfect sweater set. Silly hat & with matching scarf. All sweater styles come in sizes 6 months, 1 to 4 years. This is a great beginner project as any basic standard knitting machine may be used. There is no ribber required. Since there is no body or neckline shaping this would be a very easy garment to teach. Kids love this style. The neckline, sleeve cuffs, and bottoms just roll up for a fashionable look. Knit it plain, striped, or add your favorite fairisle or motif design. Ribbed bands with SUPER EASY TO DO BUTTONHOLES with instructions. Knit this in plain, Fair Isle, or with cables. The front band is knitted in one continuous piece in 1x1 rib knitted vertically, then attached. This band has a very easy buttonhole that can be made in a variety of sizes to fit the button of your choice. 4004I Baby will look just adorable in this baby creeper (onesie) with snap crotch that makes changing diapers easy. Knit this in pretty pastels or bold bright colors. Add your favorite motif on the center front. Stripes would look great too! Sizes: 6 months, 12 months & 18 months. Any infant will look adorable in the baby coveralls. Sleeveless crew pull-on with snap crotch with ribbed bands. Knit this in pretty pastels or bold bright colors. Add your favorite tiny motif on the pockets for that special added touch. Knit with a coordinating top, such as the Infant Roll Turtleneck (4006I) and create a fantastic outfit for that special little one. This infant Roll Turtleneck Top is so cute and easy to do that even a beginner can do it. Knit in solid pastel or bright colors. Really cute in stripes. Roll turtleneck with long sleeves! Great beginner project as NO RIBBER is required. Learn to make a terrific top as your first project. This sweater length top has long roll sleeves with a slightly shaped neckline that goes into a mock roll turtleneck. The bottom even rolls up for today’s good fashion look. Includes charted design: School Days with Checked border. Alphabet letters A to K Included. This great looking pullover is today’s fashion rage with the kids. A great easy roll neckline with no shaping to do. The longer body style, with longs sleeves and rib bands will be a big hit at school. Wear it over brightly colored tights. Dress it up or down by adding a large motif, an all over fair-isle design, cables or stripes using leftover colors. Includes charted two designs: Heart with stars and stripes (40hx60w) and Stars and Stripes sleeve border. Our slightly oversize sweater with a crew neckline can be made with long or short sleeves for any season. Dress it up or down. A large all-over design would look great or just center the motif of your choice on the front. Super simple straight skirt that will go with any our great Kidoodles sweaters or tops. Choose the ribbed bottom that is approximately knee length or the mini version with a welt hem or mix and match the length with the hem styles. Includes charted two designs: Stars and Balls, and Hearts and Swag Bows. This skirt so great that every little girl will want one. The bottom flares slightly with a roll or welt hem and features an elastic waistband. The tummy area is shaped to fit slightly snug and created basically by tension change. We like to add design work to the bottom half of the skirt and keep the tummy area in solid main color. Includes charted three designs: Staggered Dots, Heart, and Chevron. This great skirt is similar to the pattern Kidoodles Skirt #1, but knitted to give the tummyarea a new and different look. Knit this one from the top or waistband down to the roll or welt hem. The tummy area is done in 1x1 rib for that fitted look. Add your favorite design to the skirt area. Includes charted 3 designs: Staggered Stars, Zigzag, and Points. Knit from the top down with NO SHAPING! 1x1 rib bodice for a super fit. This child‘s jumper is so easy to do with no shaping for the neckline or the armholes. The 1x1 rib bodice does it all for you. This adorable jumper can be worn sleeveless, or you can add your favorite top underneath on cool days making it a garment for all seasons! Add your favorite Fair Isle border along the bottom edge for that special touch. Includes charted three designs: Hearts Together, XOX; and Heart, and Diamonds and Hearts. The little dress has a scoop neckline with rolled or welt hemline. The neckline and armholes have rolled edges for that simple finish. Our sample was knitted in white with multi-colored dots on the bottom skirt area. A big hit! Includes charted three designs, three sizes of staggered dots. Child sizes 1, 2, 4, and 6. These fun Capri length pants are great for spring or summer wear. We like to knit these in bright solid colors and add a matching top. Either Tickler Top (4029C) or the Camisole Top (4035C) would be great. The pants are mid-calf length with a welt edge and elastic waistline. Add pockets to the hip area with a great motif or crazy Fair Isle pattern design. Includes charted one design: Crazy Checks. Sizes 2, 4, 6, 8, 10, 12, 14. This pattern is one of our best yet. A very nice style that will please either a boy or girl. The separate band is easy to do with super simple buttonholes. We have done this cardigan in so many different designs, from motifs on the fronts to different colored ribs and bands. Just let your imagination go wild! Another one of our best patterns, this basic crew cardigan is slightly over-sized with drop shoulders. The simple to do band has very easy buttonholes. Great look for either a boy or girl. Add your favorite Fair Isle design or motif. A solid color is always a basic to any wardrobe. Knit it in school colors for fun school wear! A basic crew pullover is a must for any wardrobe. Our style has single rib bands and a choice of long or short sleeves. Knit ours solid, striped, in bold Fair Isle or just add your favorite motif on the front. Our basic boat neck sweater has a roll neckline with long sleeves with rib bands or short sleeves with roll bands. The bottom or either style has ribbed bands. Very easy for the beginner. Knit the sweater solid, striped, bold Fair Isle, or add your favorite motifs. Includes charted three designs: Neon Letters, Cool Letters, and Large Spotted Puppy in Spotted background. Our basic style of a raglan pullover. Wear this with any of our great skirt patterns for a fashionable outfit. Knit the sweater solid, in stripes or add your favorite motif across the chest area. Try wide stripes on the front and polka dots on the sleeves. Our basic puff sleeve pullover is great for those special occasions when done with a touch of specialty yarn as an accent. This pullover has an easy roll neckline, ribbed bands, and long sleeves that are slightly puffed at the cap. Our basic dress has an easy roll neckline with long sleeves and ribbed bands. This will look terrific knitted solid or in wide stripes. Add a wide stretch belt with a large buckle for that special touch. The kids just love these fun tops. Wear them alone on warmer days or add a long sleeve turtleneck top underneath on cooler days. Wide and colorful stripes make these extra special. This Shirttail top is a real hit with the kids. It sports a terrific and easy no shape roll neckline. You can make the short sleeves with a welt hem or just let them roll. The bottom edge of this top has the shirttail look with a small welt hem. Knit it solid, stripe it or add a terrific motif. This Shirttail Pullover has a rounded bottom hem, crew neckline style and long ribbed sleeves. It's a big hit with the kids! Knit it solid or add your favorite motifs or Fair Isle designs. Includes charted large cute elephant design, (79h x 60w)designs: Cool Sunshades, and Heart Sunglasses. Our camisole is great for those warm days worn as is or try it under a light weight cardigan with a matching skirt. Ribbed bands at both the top and bottom help keep it in place and prevent it from rolling. Two different styles of straps give you greater flexibility and creative freedom. Add either the great braided straps or the ribbed straps. These are great knitted solid or with tiny borders. Includes charted Tulip motif, and four borders: Rings, Crenellated Hearts, Crenellation, and Dot-Diamond. Our Roll Turtleneck Top is drop shoulder in style with a mock roll turtleneck neckline. The body and long sleeves have ribbed bands. The kids just love this style! Knit this solid, striped, or add your favorite Fair Isle designs. A basic tank top for those warm summer days or wear it under any of our cardigans as a matching set. Optional ribbed or rolled neckline and armhole bands can make this just a bit different by choosing either style. Knit it solid, wide stripes, or in Fair Isle design. Includes charted Ice Cream Sundae design, 145h x 50w. The Full Sleeve Pullover has a crew neckline. The bands are all ribbed. The long sleeves are full and gathered at the wrist and sleeve cap for a clean looking style. Lace and appliqué added create a special touch. Includes charted Cute Horse Head design, 115h x 50w. The BABY BLOOMERS are really cute. Mix and match them with any of the tops for a great set. The girls style has a little ruffle around the leg for a dainty look. The boys style has a welt hem leg that you could add elastic to for a tighter fuller look. Make the boys style without any leg elastic and you have infant SHORTS! Add any cut infant motif for that special touch. Sizes 6 mos., 12 mos., 18 mos., 24 mos. The ruffle is sewn on and is gathered with a roll edge. If preferred, you could hem the ruffle edge. Standard Sizes 2, 4, 6, 8, 10, 12, 14. We have included instructions for long and short roll sleeves. The edges all roll, but you could add rib or crochet for a more finished look. The Chenille Baby Bunting with matching hat is so cute and soft. The one size will fit most infants. The front edge and neckline has a nice crochet finish, but you could add any finish such as rib, if desired. Included charted Rocking Horse Design, 50h x 20w. The childs Bloomer Short has a cute gathered or ruffle leg edge. These look great with any of our summer or sleeveless tops. The elastic is used for the leg gathers. This Chenille Crew Pullover is great for special events. The soft feel of this yarn is wonderful. Infant Sizes 6 mos., 12 mos., 18 mos., 24 mos. Includes charted Stars design, 46h x 51w. Machine knitting pattern for childre rolled turtleneck pullover in chenille. The Chenille Roll Turtleneck is sooo cute! The soft feel of chenille is very elegant for those special occasions. Knit a matching chenille skirt. The standard Diagonal Tuck Roll Turtleneck is cute. The tuck pattern gives this pullover a very unique look and feel. Includes charted Diagonal Tuck pattern design, 48h x 24w. The standard turtleneck is fun to wear anytime. The ribbed turtleneck folds down for a comfortable fit. Add your favorite fair-isle design all over or just add a motif to the center front.